Mother of Shyanna, who has autism, shared her experience with Shyanna’s autism service dog, Spring. Thank you! 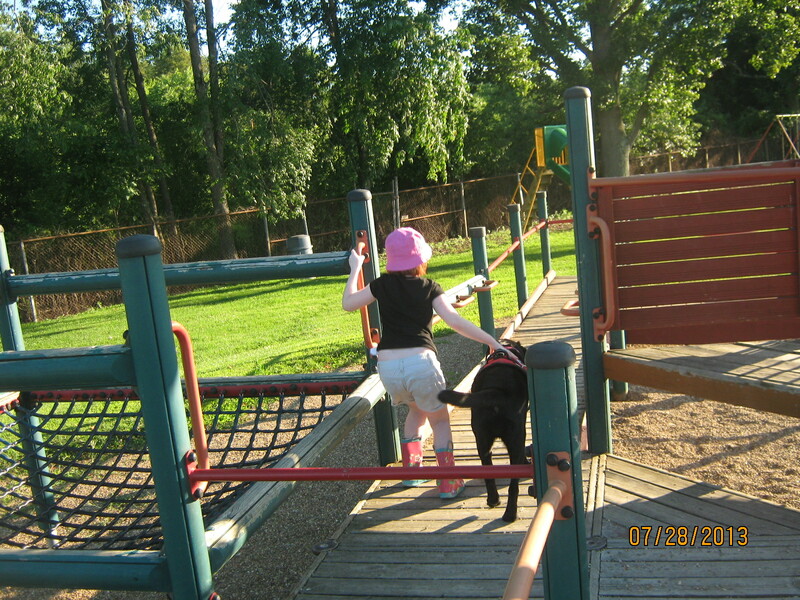 Some people may ask why my daughter needs a service dog. The short answer is Shyanna has autism. The longer answer is that we went through hell the first three years of Shyanna’s life. Everything was “Shy can’t” or “Shy doesn’t.” Shyanna doesn’t sleep at night, she can’t talk either. Then, the wandering started to happen. Shy managed to open doors that had alarms and high locks. I jokingly told people that she needed a search and rescue dog just for herself. Then, her early intervention therapist told us about another family that was raising money for an autism service dog. I started doing a search on the internet for more information, and boy oh boy where there tons and tons of places that seemed to train service dogs. Most had long waiting list ( 5-8 years) and many had age limits. There was also info about scams, people getting untrained dogs, etc. This scared me a little . In my search I found an organization that was based here in Ohio and they let me speak with families who had already gotten their service dogs. 4 Paws for Ability seemed to be the right partner in this journey for our family. The challenge, however, was that we would have to raise $13,000 to help offset the costs of training and raising the puppy at 4 Paws the first year. We started down the long road knowing in our hearts that this was what we needed to do. It took 3 years from the time we started fundraising to the time we met our service dog, Spring. In July 2012 we got the call from 4 paws for ability that we had completed our fundraising goal and were being placed in the June 2013 class. We got a letter from Shyannas service dog about a week before class. She was a beautiful, black lab named Spring. The class was two weeks long and we had to pass a public access test with Spring in a local mall to show that we could handle Spring in public places before heading home. Spring is trained to do something called ‘behavior disruption’. By giving a specific command to Spring, she can then interrupt some of Shyanna’s behaviors and help her focus, redirect, and become engaged with her environment. This will especially be useful in the school setting when being engaged and focused is always an issue. The caregiver/handler can say “nudge” or “touch” to send the dog to stop behaviors and/or break cycles. The commands “lap” and “kisses” can be used to break the meltdown cycle before it escalates to the point of “no return”. If used when the early signs of frustration are noticed, the dog can effectively stop the frustration from turning into a full blown meltdown. The presence of the dog is comforting and calming allowing Shyanna to be more focused and able to stay on task longer. However, please be advised that the main purpose for this dog is not emotional support, but she will assist in keeping Shyanna engaged in appropriate behavior, and steer her to calmer grounds by helping her regulate her emotions. In addition the dog has been trained in skills to promote safety for Shyanna. With tethering it is impossible for her to wander away and become lost.. For Shyanna, this promotes independence as the service dog is keeping her on track rather than an adult. In addition, in situations where tethering can’t be used (for example on the playground) if she were to run off, the dog would be able to track her quickly as the dog is fully scent trained to provide emergency search and rescue tracking. A service dog is a dog that has been task trained to help a person with a disability. Where can a service dog go? Any where that is open to the public. How do I know its a service dog? Can I pet a service dog? This is up to the handler. Each service dog is trained differently. Sometimes it is dangerous for the dog to be distracted away from the person it’s working with – and a simple pet on the head will do that. Always ask the handler if it’s OK to pet the dog. But never get offended if they say no. The dogs are working and need to remain focused. What is the difference between a service dog and a therapy dog? Service dogs are able to go anywhere their handlers go. Even indoors. They have what is called “Public Access”. This includes places like malls, libraries, schools, movie theaters and dining establishments. Therapy dogs are allowed in hospitals, doctor’s offices, schools – places where it would be beneficial to provide services to adults and children. A special note : Many service dogs now wear what is called a ‘gentle leader’. This is a special lead that goes over the dogs mouth and behind their head. It works much like a horses halter and provides gentle pressure on their muzzle instead of pressure around the neck. The result is that the dog attends better to the tasks we’re asking them to do. It’s safe and comfortable for the dog, and she can still open her mouth to eat and drink while it’s on. ← Waiver? What is that?